If you have any questions about the ADELE information page below please contact us. This sailing yacht ADELE is a superyacht of substantial proportions. 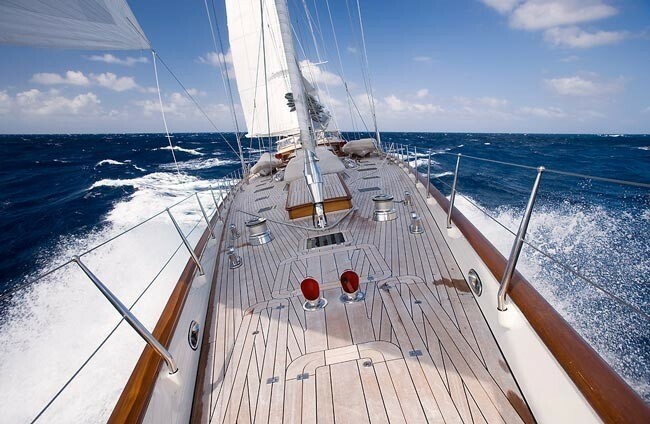 This 55 metre (180 foot) luxury yacht was made by Vitters Shipyard Bv in 2005. Superyacht ADELE is a sumptuous yacht that is able to accommodate a total of 12 passengers on board and has around 9 crew members. The firm of naval architecture which delivered her plans and general arangement on this ship is Hoek Design. Hoek Design was also the one who saw out the overall interior design. 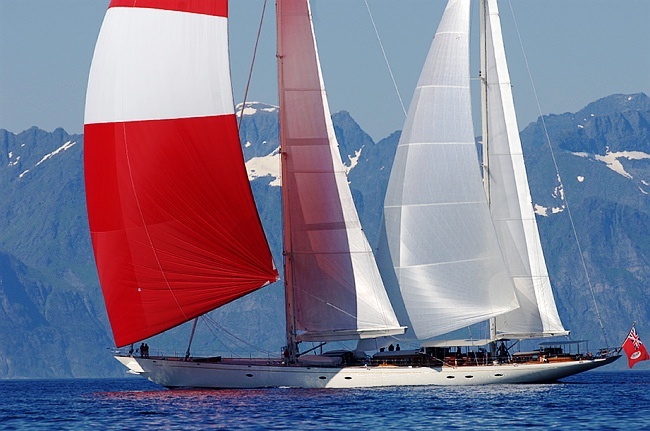 S/Y ADELE combines the classic lines of yachts like the early 20th century J-class yachts, such as the Prince’s of Wales BRITANNIA and Kaiser Wilhelm’s METEOR with a contemporary rig and underbody ensuring fast ocean passages. The long overhands, low freeboards, flush deck and tall masts give the yacht beautiful lines. Her sheer size enables both elegance and comfort. The yacht's wider design collaboration came from Hoek Design. 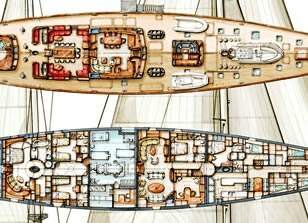 The professional naval architecture drawings are the work of Hoek Design. 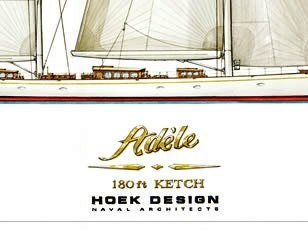 Sailing Yacht ADELE received her stylish interior designing from the interior design firm of Hoek Design. In 2005 she was actually launched with accolade in Zwartsluis and following sea trials and finishing touches was afterwards delivered to the yacht owner. Vitters Shipyard Bv completed their new build sailing yacht in the Netherlands. The core hull was crafted from aluminium. 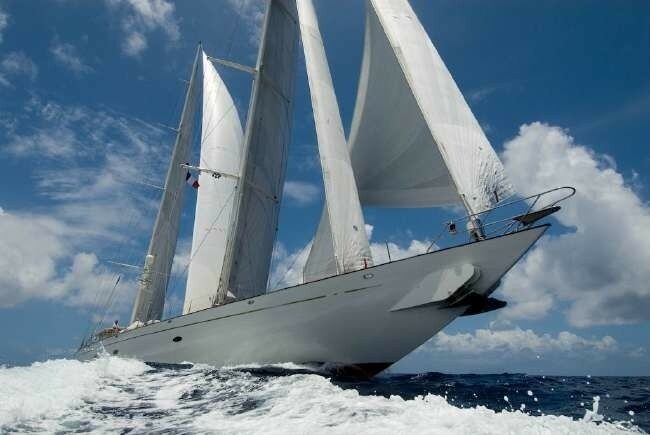 The sailing yacht main superstructure is made largely using aluminium. With a beam of 9.51 metres or 31.2 feet ADELE has spacious interior. A deep draught of 4.8m (15.7ft) limits the list of ports she can visit, taking into account their particular characteristics. 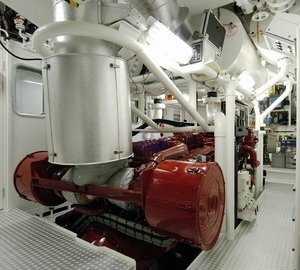 The main engine of the ship produces 1000 horse power (or 736 kilowatts). Her total HP is 1000 HP and her total Kilowatts are 736. She is driven by a single screw propeller. ADELE has a/an efficient cruise speed is 13 knots which offers a range of 6500. Bestowing space for a limit of 12 visiting passengers overnighting, the ADELE accommodates them in luxury. She also requires around 9 able yacht crew to run. Range in nautical Miles is 6500 at a speed of 13 knots. Fort Lauderdale. United States. Broward County. Florida. In Sept 2009 ADELE sailed to Fort Lauderdale, in United States. 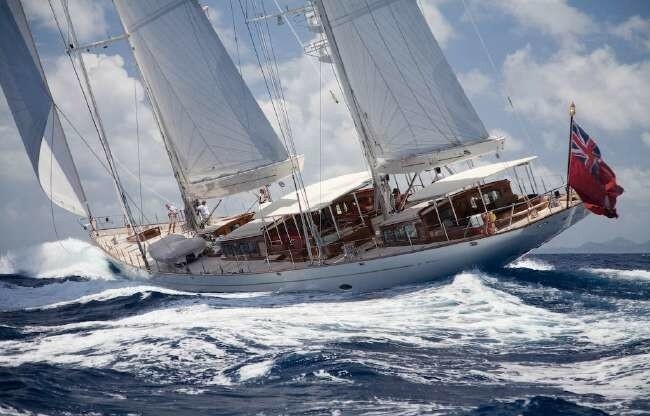 This sailing yacht also cruised the waters within Broward County during October 2009. Heinen & Hopman is the company which installed the AC . ADELE features a teak deck. The luxury yacht ADELE displayed on this page is merely informational and she is not necessarily available for yacht charter or for sale, nor is she represented or marketed in anyway by CharterWorld. This web page and the superyacht information contained herein is not contractual. All yacht specifications and informations are displayed in good faith but CharterWorld does not warrant or assume any legal liability or responsibility for the current accuracy, completeness, validity, or usefulness of any superyacht information and/or images displayed. All boat information is subject to change without prior notice and may not be current.